One of the oldest Bohemian castles is located here, built in ~1250 AD. It is situated near the River Vlatavou where we have collected reed canarygrass (Phalaris arundinacea) at many sites. The town is so named as the Rozenbergs owned it until 1611 although numerous other royal occupants owned the town before and thereafter. We looked and looked throughout the town but could not find this cemetery despite the specific directions of 100 m south of the town square, adjacent to the town wall near the street, Horni ulice. After looking for quite awhile and, seeing no one to ask more about its location, we ventured to the north side of town to look for the newer Židovský hřbitov. This was not in the designated location of some 500 m north of the town. Instead, it was approximately 2.5 km north of town! We had to keep driving and looking at every side road until we found it at the intersection of the road along with someone's driveway. It's true location is just south of the Penzion Studente on the west side of the road. Again, no adjacent place to park our car, so we park north near the bus stop and walk to the cemetery gates...carefully walking through the rough 'field' of thawing Bohemian soil. Here the gates are ajar! A small stairway leads up to the driveway that goes up the hill to a couple of farmer's homes. As we climb the stairs, we see the corner of this triangular cemetery that meets the two roads' intersection. 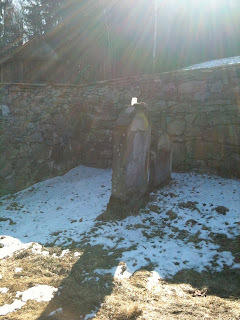 Neil, being an avid Vermont stonewall builder and admirer always stops to look at the curvatures, the methods of stacking stone on stone and how they are held together to withstand the forces of frost heaving. Looking eastwards towards the Vltavo River tucked down in the small valley, the brown skeletons of deciduous trees float off from the spires of the cemetery markers--most of which, again, were replaced after the destruction wielded during the Nazi occupation of South Bohemia. Even the adjacent alder thicket (Alnus spp.) offer their own take on the cemetery markers, lifting them skyward...bouyant catkins of promise holding tomorrows' pollen. Another view of the wall from where the alder stands. It is invitational. This newer cemetery does not have any oak trees surrounding it at all (quite unusual), nor is there any evergreen ivy, Hedera helix, anywhere to be found. Perhaps this is due to the newer age of this cemetery, only dating back to the late 1800s. Were the oaks and ivy planted only in earlier times as permanent, living markers of grief and sorrow? We don't know. There is, however, outside the gates, an escaped planting of Vinca major, periwinkle. Glistening in the morning sun. overhead from the soft maple just outside the walls, we look up and note someone's carefully positioned birdhouse. A woodpecker hammers out a greeting to us, having found some good source of morning bugs. We stop and listen as we enter the gates. The woodpecker stops. We faintly hear the drip of sap from the exterior maple hit the surrounding leaves. From cracks in its branches, it rains faint tears that each spring weeping on us fall. Several older stones again are laden with stones of remembrance on top, melded with patinas of faintly green lichen. Hebrew and German now filled with chartreuse lichen words. Someone has visited recently, a drying sprig of silver dollar eucalyptus, Eucalyptus globulus, rests between stone and stonewall. soaking morning sun while looking at the adjacent barn. Close by the barn, the intriguing method of attaching electric posts to solid concrete foundations frame his view. They have markings on them....do they have meaning? Post marking identifiers? We cannot figure them out. melding frost and snow of ground into the immortar foundation. To the sides, cold and darkened windows view the hill. we see a front door and bird feeders...perhaps the builders of the one in the maple tree?